20% off ALL GeeknSon Products! Perhaps a good item for Seinfeld collectors and maybe good as a party game, but not recommended for serious gamers or anyone looking for a lengthy game of any kind. 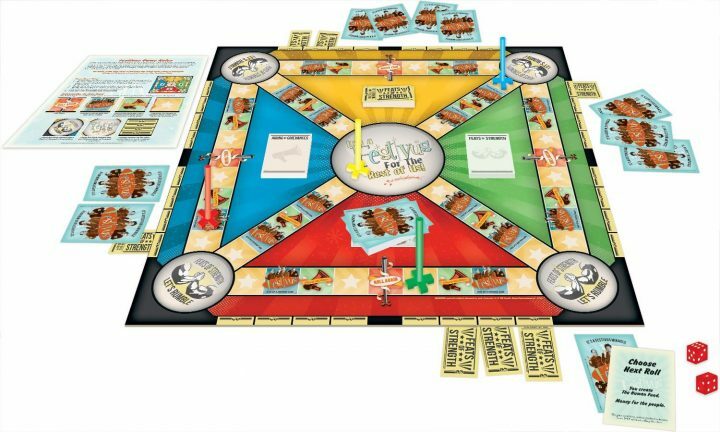 I am a big fan of Seinfeld as well as board/tabletop games, so I was excited when I found out a game had been made based on one of the show’s most iconic episode “The Strike”, aka the Festivus episode. A Festivus for the Rest of Us is said board game, which my family and I acquired this past week. After our initial playthrough, the game feels a bit like the show’s finalé: something of a letdown. The game is extremely basic, both in its rules and its presentation. Each person chooses a different colour Festivus pole and moves around the board. 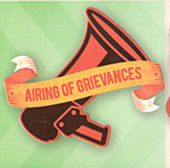 The spaces are Festivus cards, Airing of Grievances, Safe Zones and Airing of Grievances. 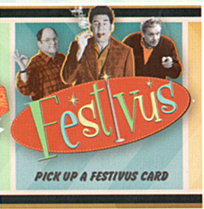 The Festivus cards play similar to Chance/Community Chest cards in Monopoly in that you just read them and follow the instructions (nothing more complicated than moving back spaces or losing a turn, too), Safe Zones are spaces where literally nothing happens, the Airing of Grievances are exactly how they sound, in that you complain about other players (and also have no actual point in the long run of the game), and Feats of Strength are physical challenges you engage in with other players. 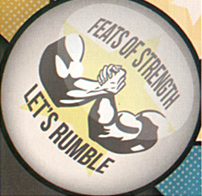 The Feats of Strength are the meat of the game. Every time you land on the spaces around the board, you engage in a Feat of Strength with another player. Other players can volunteer to challenge you. If more than one wants to challenge you, you get to choose your opponent. If no one wants to challenge you, you automatically win. The Feats of Strength are decided by the players prior to play (thumb wrestling, staring contests, etc. You can choose whatever you like), and if you land on a space and then win the Feat, you win a ticket. If you lose, you just lose; no one else collects the ticket. Collect four tickets, and you move to the center of the board, where you compete in one final Ultimate Feat of Strength, which you get to choose from the agree-upon list. If you win, the game is over. If you lose, the game continues and you have to try again. From there…well, actually, there is no from there. That’s how simple this game is. The rules are covered on a single page, and there is very little to the game overall. Depending on how many are playing, you are likely to finish the game in under an hour. The Airing of Grievances, as I said, offer absolutely no point overall to the game. They don’t affect who wins or loses, change the structure of the game, nothing. They’re just there. This potentially could be fun if you’re with a bunch of friends and want to really lay into each other (or get it turned into some kind of drinking game, if you imbibe), but it’s very poorly executed. As far as the pieces go, nothing special. The poles are plastic, dice are standard, Festivus cards are standard card stock, the Feats of Strength tickets are a thick paper and the Feats of Strength/Airing of Grievances pads are basically Post-Its without the glue (Oh, that’s another thing: the Airing of Grievances are supposed to be stuck to the other players, but there’s no glue on the backside, so you’ll essentially just collect them in a pile). And really, that’s it. Overall, it’s not the worst game I’ve ever played, but it’s pretty disappointing overall. 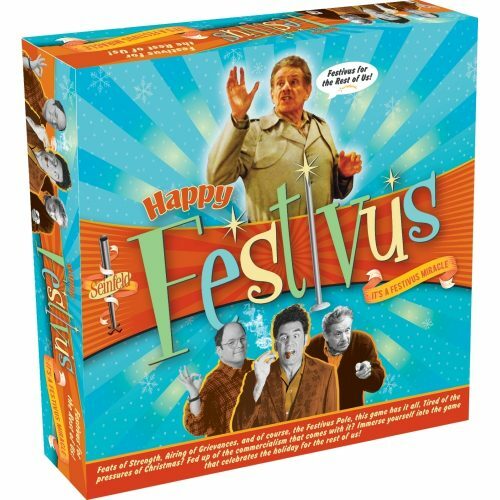 It feels like it was rushed to market, despite the fact that board games have had nearly 20 years to make a Festivus game. You may really like it, but it’s nothing I’d recommend you go out of your way to get.